As war hangs over England, a town councilor staggers into his home in Croxburn after what seemed a perfectly ordinary train ride from Euston Station and dies of mysterious causes in this reprint, first published in 1943. Despite his invincible ordinariness, Henry Grayling seems to have given everyone who knew him reason to dislike him. His wife, Renata, had gone so far as to take a younger lover, publishing assistant Hugh Rolandson; George Ransom, a corporal in the same Home Guard platoon where Grayling served as second lieutenant, had clashed with him recently and insolently; Charlie Evetts, an assistant in the chemist’s department of Barrow and Furness, where Grayling worked as assistant cashier, had particular reason to fear him; even the vicar of Croxburn found little Christian sentiment in his churchwarden. Clearly Inspector Holly has his work cut out for him. It’s true that there were only nine other people in the railroad carriage that took him to Croxburn, but their number included Rolandson, Ransom, Evetts, and the vicar, as well as Albrecht Mannheim, a refugee who’s been under suspicion ever since he was rescued from the Third Reich. Since Grayling was carrying a weekly cash payroll of over 124 pounds that’s now disappeared, there’s an obvious motive for the crime. But besides whodunit, Holly must also figure out howdunit, since it’s not at all obvious what brought about Grayling’s death. 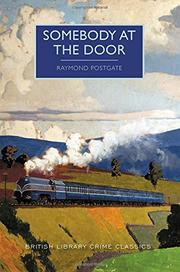 Postgate adapts the most striking structural device of his much better known Verdict of Twelve (1940/2017) by devoting most of his narrative to detailed back stories of most of Grayling’s fellow passengers before returning to a present in which Holly tries out one possible solution after another before hitting on one as logical as it is surprising. Less original than Verdict of Twelve, and marred here and there by dated political satire, but still clever, absorbing, and wide-ranging: another welcome rediscovery by the British Library Crime Classics.